Most novels and comics that I read aren’t new releases. This makes things a little complicated when it comes to end of year lists. Most often those kinds of things are focused on new releases. If I focused on new released I’d have a really small list. You’ll find a couple titles on my list that are new releases, but most of these of older books. In previous years I’ve organized my end of year list by categories such as Science Fiction Novel, Fantasy Novel, Best Manga, Best Comic Book, etc. This year I’m lumping it all together and simply listing my 20 favourite comics and novels read in 2015. These are books that I’ve read in the last year, not books that were published in the last year. Still, all of these books were new to me and I didn’t include anything I reread and enjoyed this year. Unfortunately, due to taking a month off in February (I got married) and because I had a two month long project focused on the Harry Potter series, there are some really good books that I read this year that I didn’t review on the blog. I planned on reviewing these books, honest, but they never took shape past my initial notes and reactions I took while reading them. Now I feel like too much time has passed for me to write worthwhile reviews. Before any more stalling, here they are, my favourite 20 books of 2015. We’ll start with books 20 to 11 today and we’ll finish with the top 10 on Sunday. One of the things I wanted to do in 2015 was read a few books that were reputed to be difficult reads. Either difficult to understand, using complex prose, or simply very dense books. Three of those books come to mind and interestingly enough, they’re all on this top twenty list. I guess the lesson here is that challenging books are often good books. Sure, three is a small sample size, but every one of these books was memorable for multiple reasons. Thomas Pynchon has a reputation for writing difficult books. Inherent Vice is said to be one of his more accessible books which is kind of mind boggling. I had a hard time keeping up with the plot in this one and there were many, many references that I didn’t catch. I wouldn’t even have realized most of them if it wasn’t for the online annotations I found, which were a fascination read of their own. One of the things that impressed me the most with this book is how versatile the writing and the story were. At time a hilarious book with some skilled and intelligent comedic writing, the novel switched gears to be a period piece, detective fiction, character centric book, to biting satire. There’s a lot to enjoy in it. Much more than what you’re used to finding in a book its size (under 400 pages) and it’s layered so effectively that there are multiple meanings for many key elements of the plot and themes. 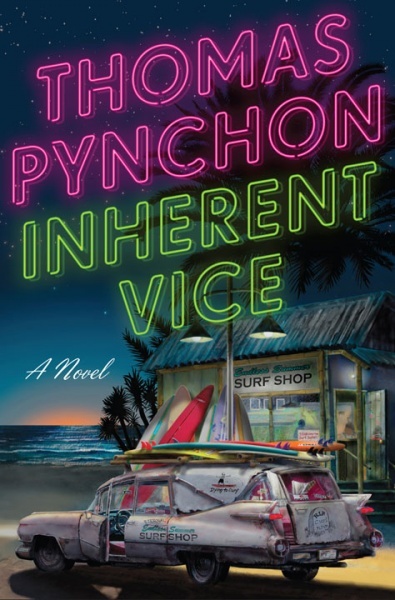 Buy Inherent Vice at Amazon. Another one of my personal goals this year was to read more non-fiction. I don’t read much non-fiction and the main reason is that I have clearly defined reading habits. Fiction, specifically genre fiction and comics, are my go to thing when I browse for new books. The beauty of non-fiction is that regardless of what you enjoy in life, there are non-fiction books dealing with a subject you find interesting. In the past, I’ve found most of what I enjoy when it comes to non-fiction is biographies by musicians or bands that I like. I’m a big Neil Young fan and it seemed like a no brainer to pick up this little book when I found it at Bay Used Books here in Sudbury, ON. 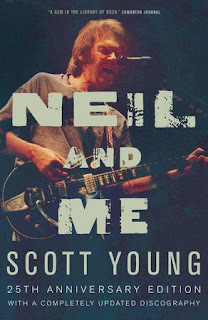 Neil and Me has an interesting angle as it’s written by Neil’s father, Scott Young, a journalist and writer. Since it was written in the 80s, the book only covers about half of Neil’s career. The focus of this book isn’t on the music or mapping out Neil’s career. Instead, it’s about Neil’s character. Who he is, why he does what he does, and how that is reflected in his music, his life, and his career. It’s about the man who makes the music from the point of view of his father which gives the information in the book a sense of immediacy and intimacy. Any fan of Neil Young would enjoy this book if for no other reason that it has a unique perspective on the rock legend. Buy Neil and Me:The Neil Young Story at Amazon. Steven Brust’s Jhereg was a huge surprise to me last year. A slim fantasy novel published in 1983 did things with world building I never could have imagined. I had no expectations coming into this book other than the fact that Jo Walton said some nice things about this series at Tor.com. What I found inside was a world that seemed infinitely bigger than the novel could actual contain. Better yet, the book was fast, precise, and instantly marked Brust as an author I respect and admire. I’m notorious for taking a long time to read an entire series. I like variety in my books and I’m constantly jumping around. I suspect this is pretty common for avid readers. The downside to this kind of habit is that it can take months to get to the second volume of a series, even after you’ve named the first book one of the best books you’ve read in a given year. Thankfully I found time to read Yendi this year. I devoured it in two 100 page sittings and the novel was delightful. I’m so very impressed by Brust’s writing. The man writes so well I’m amazed I never heard of him until a year ago. With this second volume in his Vlad Taltos series, Brust provides us with a prequel. He tells the story of how Vlad got his first big break in the Jhereg world of crime. In Yendi he acquires a small territory and has to defend it against a richer and more powerful rival trying to squeeze in on his streets. The simple and small time crime war ends up being tied to a secret plot between Dragaerans that reaches as far back as a millennium ago. 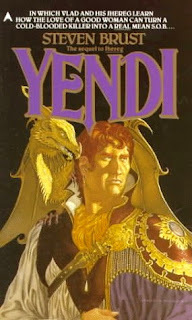 Though not on the same level of quality as Jhereg, Yendi proves that Brust can consistently write fast moving, tightly plotted, and complex narratives in a fantasy world setting. That he does it with style and snappy dialogue is simply icing on the cake. Did anybody else get excited about Star Wars in 2015? I feel like I was the only one. Like many other readers and fans of the franchise, I spent my time in anticipation for the movie reading Star Wars novels. 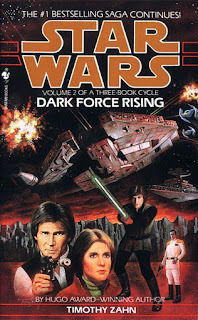 In the first half of the year our options were mostly limited to works in the Expanded Universe which were sadly but understandably pushed aside in place of new post-Return of the Jedi continuity which now goes under the name of New Canon. Later on in the year, receiving a big push in the fall, was the arrival of plenty of tie-in media under the line of Journey to Star Wars: The Force Awakens which provided fans with a wide variety of tie-in fiction. Most of what I read this year was part of the EU. I particularly enjoyed The Thrawn Trilogy of novels by Timothy Zahn. It’s an excellent series that provides a satisfying continuation of the saga and further development of well-known characters, essentially giving the franchise new life during its original publication in the early-to-mid-90s. In addition, Zahn included many new characters which have remained popular in the EU for two decades. In December I read some of the new comics by Marvel and while I enjoyed them they weren’t as good as the novels. I find that the franchise requirement and focus on action didn’t allow for much character development or complex plotting. I still got my fill of good characterization and action with the short novel Smuggler’s Run: A Han Solo & Chewbacca Adventure written by Greg Rucka with illustrations and cover by Phil Noto. A character centric story, Rucka proved to have a good grasp on Han and he included a new villain for the New Canon, a character I hope to see again. Buy Heir to the Empire at Amazon. 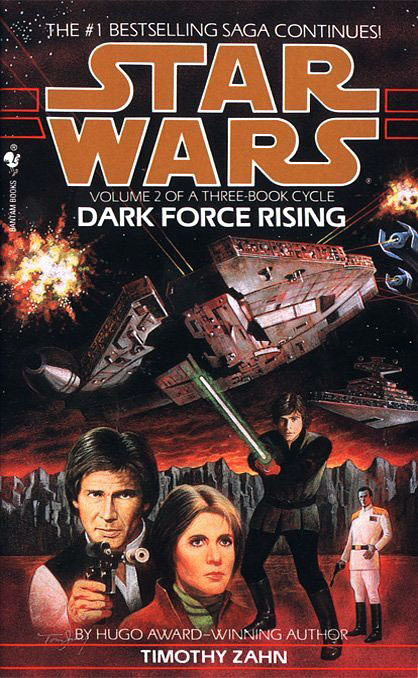 Buy Dark Force Rising at Amazon. Buy The Last Command at Amazon. Buy Journey To Star Wars: The Force Awaken Smuggler’s Run: A Han Solo & Chewbacca Adventure at Amazon. Love and Rockets might just be the best comic of the last thirty years. It’s been in near continuous publication since then, too. The most recent format is an annual paperback. It’s done in an anthology style, similarly to the original series that began in the 80s. Each issue contains stories of varying lengths by Jaime Hernandez and Gilbert “Beto” Hernandez. In this new format, the Bros Hernandez have been using their comic to continue the decades long stories which consist of a cast of characters in the hundreds. In this issue, Jaime focuses on two different stories. The first one is about his two most famous characters Maggie and Hopey as they travel to their hometown for a reunion with old friends. The second story deal with a new character recently introduces in an earlier issue of New Stories. His grasp of aging punkers and their 21 Century equivalent is as exciting and endearing to read as some of his most acclaimed stories. As always, his art is clear and beautifully rendered. Jaime’s art is instantly recognizable as the work of a master of the comic book medium and it’s a regular pleasure to see him continue to refine his skills in these annual volumes. As for Gilbert, he hasn’t been doing the same kind of stories as found in his earlier Palomar work. Rather, the comics he’s doing today are an extension of the stories he’s started all those decades ago. While Jaime has been perfecting his style of storytelling, Gilbert has been letting loose. His art is as imposing as ever while his dialogue is getting sharper and more unusual. Still, he’s been building a complex and multilayered story based on the grandchildren of his matriarch Luba. Her granddaughter, Killer, has become a favourite of mine in the last few years. If anything, half of the annual paperback doesn’t seem like enough room for Gilbert and his big ideas. I guess that’s why he’s been doing many side projects in recent years. One thing is clear, however, the Bros Hernandez are still at the top of their game with Love and Rockets: New Stories. Buy Love and Rockets: New Stories #7 at Amazon. This is another book I read specifically because it was non-fiction. And because it’s about dinosaurs, obviously. As a fan of dinosaur and prehistory in general, I’m rather uneducated in the whole thing. This book, which I received as a gift from my little sister after I dropped some not-so-subtle hints, was chosen as a good starting point because I had read some of author Brian Switek’s online articles. I enjoyed his style and the knowledge he has on the subject of dinosaur and prehistory. He’s got an infectious energy when discussion these particular subjects. Sampling his work online gave me a good appreciation for what he does and encouraged me to check out this book. 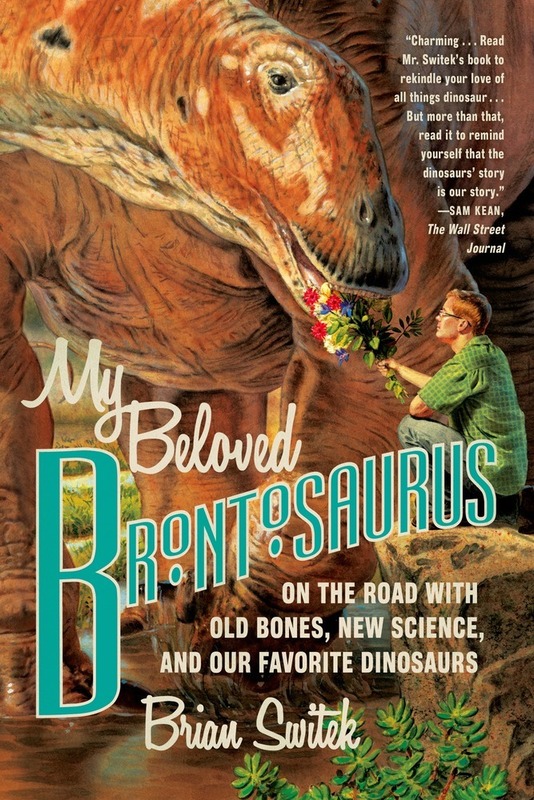 My Beloved Brontosaurus is a good introductory book for mature dinosaur fans (not targeted towards a child audience). The writing style is conversational without being pandering or condescending. Switek writes with quite a bit of energy and the whole thing is structured in a way that is approachable. You could know nothing about dinosaur and read this book without feeling lost. Some books on the subject of dinosaurs get lost in the specific language of the field of study and casual or amateur fans of dinos can find it difficult and confusing. There is none of that here. If you finish reading My Beloved Brontosaurus and you want to get something more details or technical language, the bibliography will provide you with dozens of starting points for further research. Quite simply, this is a great book to introduce fans to the world of dinosaurs. Buy My Beloved Brontosaurus: On the Road with Old Bones, New Science, and Our Favorite Dinosaurs at Amazon. What can I say about Parker that I haven’t said already? I’m a fan for life, that’s got to be clear at this point. In The Seventh, Richard Stark’s writing is as precise as ever. His prose has a poetic brutality to it. There is no sentimentality for the characters or sympathy for their actions. It suits the main character quite well. Parker gets in a situation where his single-minded attitude and his drive for a particular goal are crucial. They are key characteristics that are essential not only to his getting his cut of the money, but equally important to his very survival. The Parker novels aren’t long, but they’re not sparse. They have a good amount of detail, but they have details without the addition of fluff or filler. The result is that each book condenses a surprising amount of tightly plotted crime stories with a fascinating character at its centre. If you’ve never read a book by Stark, I strongly recommend you give them a try. 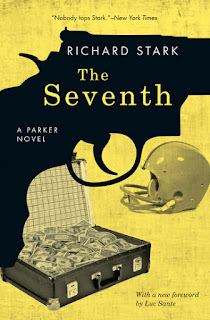 The Seventh isn’t his best book but it’s still a skilled novel that has earned its place in the consistently excellent series of novels starring the coldest, most practical, and most professional criminal in literature. Buy The Seventh at Amazon. Reading Anne McCaffrey’s Dragonriders of Pern series since I started Shared Universe Reviews has been one of the most consistently enjoyable reads. As a whole, the series has its flaws but I still find a lot to enjoy in these novels. I’m not suggesting these flaws should be ignored. I’m saying they shouldn’t be the sole focus of your evaluation of these books. Really though, none of that matters. Those who take the time to read the novels in the Pern series will be rewarded with a rich science fiction and fantasy world. The kind of place that is realized in such detail that you could (and likely will) spend hours of you time visiting the distant planet in your imagination. This year I read three novels in the series. Two of them (Dragondrums and The White Dragon) closed off their respective trilogies and effectively concluded the first portion of the series which is made up of two trilogies that complement each other nicely. 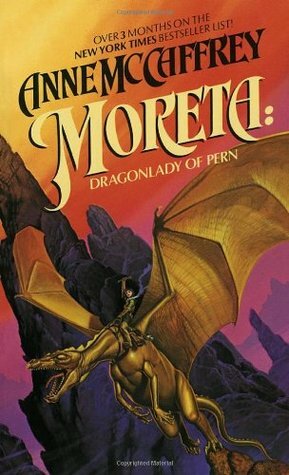 The third book I read provided readers with a look at a particular time in Pern’s history and giving us the story one of their legendary Weyrwomen, Moreta. In this book McCaffrey excelled at telling a science fiction story in a fantasy world setting in ways that I still find impressive. Moreta: Dragonlady of Pern acts as the introduction novel to the second portion of the Pern series, the portion that looks at Pern’s history and provides readers with many answers to six novels’ worth of questions. Am I cheating by including three books here? Nah, I don’t think so. They’re all part of a series and they’re all connected. I listed the individual titles I read but I could have simply put Dragonriders of Pern as the title. If you really want to pick a single title, I might suggest The White Dragon. Though if you asked me the same question tomorrow, I’d likely answer with Moreta: Dragonlady of Pern. When it comes to classic books, these are oldies but goodies. I’d call them a guilty pleasure if that didn’t suggest they aren’t worth reading. They certainly are and I’ll continue to do so for many more volumes. Buy The White Dragon at Amazon. Buy Moreta: Dragonlady of Pern at Amazon. Kate Beaton is Canada’s gift to comedy and literacy. I can’t think of any other cartoonist that combines such a wide range of sources for jokes as she does. There are so many enjoyable things to find within the pages of her latest collection of comic strips. Pop culture references, low brow humour, history jokes, and literary based gags all share space between two covers. There is quite literally something for everyone. What impresses me most of all isn’t the style of humour but the execution of it. I admit that it took some time for me to adjust to Beaton’s art when I first encountered her work. Since then, I’ve simply grown increasingly found of it. This resulted from my understanding her style of cartooning. Beaton is a very expressive artist and while some of her art can occasionally look a little crude, it’s the gestures and the slightly raw execution that strikes a chord with me. Beaton isn’t just a good comedic writer she’s also a skilled artist. She excels at body language. It’s the details that add to the movement and facials expressions of her characters that make the jokes land and work better than they should. Beaton also excels at making feel guilty. After reading her comics I feel like I need to read more history books and classics literature. It’s not my fault that I’d rather read Step Aside, Pops. She’s the one who had to make perfectly hilarious comics that distract me from reading the classics. 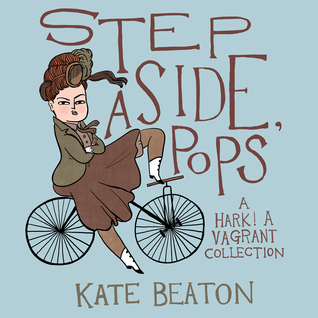 Buy Step Aside,Pops: A Hark! A Vagrant Collection at Amazon. You can read most of Kate Beaton’s comics at her website Hart! A Vagrant. Be sure to check it out as it’s pretty rad. Cormac McCarthy writes brutal books. His style of writing is also pretty rough as his often strays from conventional syntax and grammar in favour of minimalist use of punctuation. The result is a style of prose that is short and sharp that creates a particular mood for his stories. The only other book I’ve read by McCarthy was The Road, a stark portrayal of humanity’s possible future following the destruction of society by nuclear weapons. It’s not an easy book to read because McCarthy includes many difficult truths about human behaviour and the challenges we have with peaceful cohabitation. In some ways No Country for Old Men is even more disturbing because it’s set a few decades in our past but presents the reader with a realistic and unfiltered look at humanity’s darker side. It’s undeniable that McCarthy is an important voice in fiction. His books pack a punch and they never shy away from telling it like it is. McCarthy isn’t looking out for his readers, instead he’s looking out for his story and the themes at play. No Country for Old Men is about humanity’s decline into a society where criminal activities are the norm. There are fascinating comparisons to be made between the three main characters, two of which are living in completely different worlds and one of which is straddling both, not really belonging entirely in one or the other. This book is about a great many things and one of them is the noticeable changes one experiences in a human lifetime, the moral ambiguity of the present, and the decline of strong values and proper civil conduct. It’s a quick and powerful read which prose that highlights the impactful nature of the story and its imposing characters. 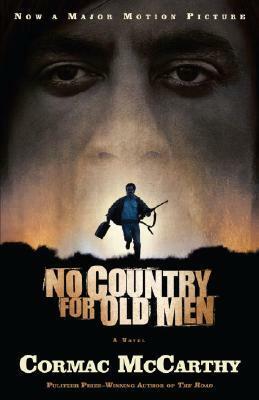 Buy No Country for Old Men at Amazon. Come back to SUR on Sunday, January 3rd, for the final ten in my Favourite Comics and Novels Read in 2015.